A fun, edgy mystery about a popular girl whose friends are not what they seem - in fact, one of them is trying to kill her. 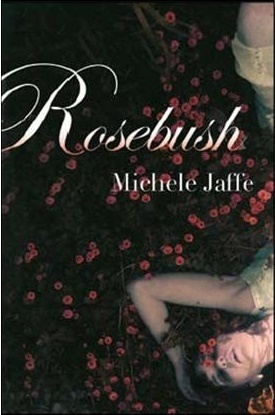 When Jane wakes up in the hospital, she finds out she was hit by a car and left for dead in a rosebush. Jane can only remember fragments of that night, but if she doesn't piece everything together soon, her life could be in danger again. Jane is not your typical mean girl popular type. She's into photography, and as her friend Scott tells her, tends to live her life in autofocus. She aims to please and to be loved by all, but for some, that's a reason to hate her. There are some deliciously warped supporting characters here, and a ton of red herrings about who the killer might be - though when you find out whodunnit, it doesn't come out of left-field either, which is the mark of a good mystery in my book. ROSEBUSH comes out in hardcover in a little over a week on December 7th. I think this one looks so good! Glad to see your review, can't wait to get it for myself! That looks really good! I hadn't heard of it before, but now I am looking forward to reading it! Wow, this sounds totally creepy but totally good. Fun! Okay, I'm definitely intrigued. Cool cover, too! This sounds like a real page turner!! Alright, you've set the hook! I love a good mystery. Haven't seen many (if any) reviews of this one yet, so thanks for your perspective! Sounds like a great YA mystery. I've had this one on my wishlist for a while now. I'm doubly excited for it knowing you enjoyed it! I love the idea of "warped" characters. Great review! I'll be reading this one soon and I'm so excited for it!! This does sound good. I love when i am just on edge of figuring it out, but I'm just not sure. This looks to be a gripping read! I'll definitely keep an eye out for it. This book sounds awesome! I just put it on my Goodreads "to read" list! YA mysteries are something that I don't usually hear a lot about, so this sounds intriguing to me. I bet my kids would love to share this book with me, so I will be looking into it for the holidays! The best part of buying YA for my kids is that I get the chance to read it too, so it really has a lot of mileage. I have this one on pre-order it sounds so good. The premise sort of reminds me of 7 Souls. It's been a while since I've read a mystery. Sounds really good! This sounds so good. I must read this!